Dry eye syndrome (DES) affects an estimated 20 million Americans and is one of the most common reasons that people visit their eye doctor. DES is caused by a decrease in the quantity and/or quality of tears. The purpose of natural tears is to lubricate the eyes to keep them comfortable, and to provide a protective barrier to bacteria and foreign particles. Tears also help to sharpen vision. 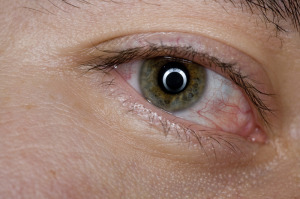 Symptoms of DES vary greatly but can include: eye ‘grittiness’, stinging, itching, foreign body sensation, redness, reflex tearing, and fluctuating vision. Causes of DES are too numerous to list here, but the main risk factors are: aging, hormone changes, environment/weather, medications, air conditioners/fans, near vision tasks, contact lens wear, and auto-immune conditions. Treatment depends on the severity and cause(s) of the DES. Generally, artificial tears are effective in treating mild/moderate DES, while artificial tear gels, punctal plugs, and medicated drops may be necessary to treat more severe cases. Punctal plugs, in particular, are easy to insert in the office, and ensure that the patient’s own tears will remain on their eyes for a longer period of time, while relieving their symptoms. Punctal cautery can also be performed. This procedure involves using heat energy to permanently close the tiny tear drain. It is also done in the office and has the same benefits of punctal plugs.